This state of continuous, unremitting seizure can be life-threatening and requires prompt emergency intervention. Status epilepticus (SE)—persistent, continuous, unremitting seizure or rapidly recurring seizures—represents seizure activity at the extreme. While most seizures terminate spontaneously in fewer than 5 minutes, no one knows why normal mechanisms sometimes fail and allow SE to develop. SE is common, with an incidence of up to 41 per 100,000 people annually, and also life-threatening, with an estimated mortality of about 20%.1-4 We tend to think of SE as a prolonged seizure of the clonictonic variety, but in actuality, SE occurs in a number of presentations. SE may be convulsive or nonconvulsive. In both types, changes in electroencephalography (EEG) accompany SE. Usually, the patient loses consciousness or develops an altered sense of awareness. Coma may develop. 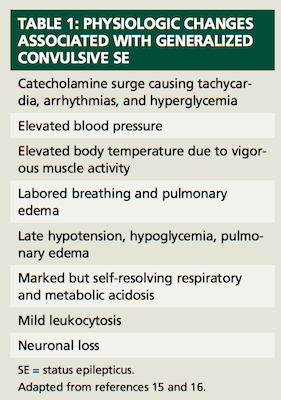 Generalized convulsive SE is more common than nonconvulsive SE, accounting for 37% to 70% of cases.13 Convulsive SE is easily recognized by its sequential motor convulsions, and is associated with significant physiologic changes (Table 114,15). When epilepsy is absent, central nervous system (CNS) insult is often SE’s cause, with about one-fourth to one-third of cases falling into this category. Stroke is the most common cause of acute SE unrelated to epilepsy. In children, fever and infection are the most common causes. In older adults, cardiovascular disease is more important.17-19 Table 23,20 lists other conditions associated with SE. Each patient’s prognosis depends on the etiology, the duration of seizure activity, and age.21 If the seizure is due to inadequate serum concentrations in a previously diagnosed epileptic patient, prognosis is good once serum levels are restored to normal. Similarly, if the SE is a presenting manifestation of epilepsy, prognosis is also good once the condition is managed with anticonvulsants. Concurrently, the emergency team will use any medical history available from family or observers to determine the most reasonable approach. If the patient is epileptic, they will draw blood to determine if subtherapeutic levels are the cause. With all patients, they also perform diagnostic studies to identify a cause and treat it appropriately. Drug treatment’s exact role in SE remains unclear and evolving. The ideal intervention will be available as an intravenous agent, have few adverse effects, allow high CNS penetrance, be easily monitored, and provide rapid relief. Until the ideal agent is found and tested, pharmacists can help choose the best agents among the many available. Ms. Wick is a visiting professor at the University of Connecticut School of Pharmacy and a freelancewriter from Virginia. Coeytaux A, Jallon P, Galobardes B, Morabia A. Incidence of status epilepticus in French-speaking Switzerland: (EPISTAR). Neurology. 2000;55:693-697. Tedrus GM, Fonseca LC, Nogueira Junior E, Pazetto D. Epilepsy with onset at over 50 years of age: clinical and electroencephalographic characteristics. Arq Neuropsiquiatr. 2012;70:780-785. Trinka E, Höfler J, Zerbs A. 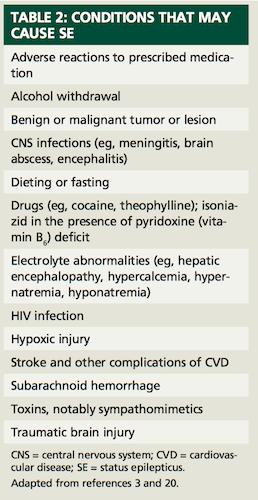 Causes of status epilepticus. Epilepsia. 2012;53(suppl 4):127-138. Logroscino G, Hesdorffer DC, Cascino G, Annegers JF, Hauser WA. Short-term mortality after a first episode of status epilepticus. Epilepsia. 1997;38:1344-1349. Lowenstein DH, Bleck T, Macdonald RL. It’s time to revise the definition of status epilepticus. Epilepsia. 1999;40:120-122. Epilepsy Foundation of America. Treatment of convulsive status epilepticus. Recommendations of the Epilepsy Foundation of America’s Working Group on Status Epilepticus. JAMA. 1993;270:854-859. Lowenstein DH, Cloyd J. Out-of-hospital treatment of status epilepticus and prolonged seizures. Epilepsia. 2007;48(suppl 8):96-98. Hunter G, Young GB. Status epilepticus: a review, with emphasis on refractory cases. Can J Neurol Sci. 2012;39:157-169. Krumholz A, Sung GY, Fisher RS, Barry E, Bergey GK, Grattan LM. Complex partial status epilepticus accompanied by serious morbidity and mortality. Neurology. 1995;45:1499-1504. Treiman DM, Walton NY, Kendrick C. A progressive sequence of electroencephalographic changes during generalized convulsive status epilepticus. Epilepsy Res. 1990;5:49-60. Treiman DM, Meyers PD, Walton NY; DVA Status Epilepticus Cooperative Study Group. Duration of generalized convulsive status epilepticus: relationship to clinical symptomatology and response to treatment. Epilepsia. 1992;33(suppl 3):66. Waterhouse E. The epidemiology of status epilepticus. In: Drislane R, Kaplan P, eds. Nonconvulsive status epilepticus. New York, NY: Demos Medical Publishing; 2008:23-40. Treiman DM. Treatment of convulsive status epilepticus. Int Rev Neurobiol. 2007;81:273-285. Galimi R. Nonconvulsive status epilepticus in pediatric populations: diagnosis and management. Minerva Pediatr. 2012;64:347-355. Walton NY. Systemic effects of generalized convulsive status epilepticus. Epilepsia. 1993;34(suppl 1):S54-S58. DeLorenzo RJ, Pellock JM, Towne AR, Boggs JG. Epidemiology of status epilepticus. J Clin Neurophysiol. 1995;12:316-325. DeLorenzo RJ, Hauser WA, Towne AR. A prospective, population-based epidemiologic study of status epilepticus in Richmond, Virginia. Neurology. 1996;46:1029-1035. Knake S, Rosenow F, Vescovi M, et al; Status Epilepticus Study Group Hessen (SESGH). Incidence of status epilepticus in adults in Germany: a prospective, population-based study. Epilepsia. 2001;40:759-762. Guekht A, Bornstein NM. Seizures after stroke. Handb Clin Neurol. 2012;108:569-583. Shorvon S, Ferlisi M. The outcome of therapies in refractory and super-refractory convulsive status epilepticus and recommendations for therapy. Brain. 2012;135:2314-2328. Hocker SE, Britton JW, Mandrekar JN, Wijdicks EF, Rabinstein AA. Predictors of outcome in refractory status epilepticus. Arch Neurol. 2012;8:1-6. Riviello JJ Jr, Claassen J, Laroche SM, et al; the Neurocritical Care Society Status Epilepticus Guideline Writing Committee. Treatment of Status Epilepticus: an International Survey of Experts [published online October 25, 2012]. Neurocrit Care. Barmashenko G, Hefft S, Aertsen A, Kirschstein T, Köhling R. Positive shifts of the GABAA receptor reversal potential due to altered chloride homeostasis is widespread after status epilepticus. Epilepsia. 2011;52:1570-1578.